The biggest part of Gould’s turkey range is in Mexico. There are also some populations in Arizona and New Mexico, near the Mexican border. Gould’s turkey hunting in the USA can be as affordable as under $500. Hunting in Mexico starts at about $2,000 for semi-guided trips, and can go all the way up to $3,000 for hunts on top private lands. Arizona Gould’s turkey hunting requires drawing a tag. Hunting in Mexico requires access to private land, and separate paperwork; both are usually arranged by the outfitter. All regular rules of turkey hunting apply. Most hunts have the one bird limit, with a second gobbler available for extra charge. When to hunt Gould S Turkey? The season in Mexico is generous, and can start as early as March 1, especially on private lands, but many experts believe the best time to hunt is mid-April to May. Mexican outfitters typically hunt Gould’s turkey from ground or elevated blinds set in areas which birds are known to frequent. 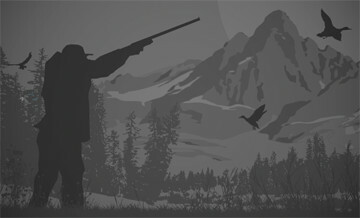 When a gobbler appears nearby, the guide uses the call to get it in range. When the stubborn bird goes away instead, the hunter and the guide may try to intercept it, and call from an improvised blind. The Gould’s turkey is the largest turkey in America in terms of body size, with legs and feet. With long central tail feathers, white-tipped and sometimes separated, and thus resembling eyelashes, Gould’s turkey “fan” stands out among other turkey trophies. Not many American turkey hunters, however, can boast of this trophy. Gould’s turkey hunting is a rare achievement and a unique experience but, between access to private land and tons of paperwork required to legally enter the trophy into the country, is nearly impossible without an outfitter. Hunting Gould’s Turkey in central Mexico with knowledeable guides, safe and private +8,000 acre land. includes delicious meals, a prepared team on your service. accommodations at the beautiful lodge cabin with all comforts needed. This is a Turkey hunt at a private game ranch. Observers are welcome at $250 per person per day.